I’m not quite sure where I’m going to start on describing this larp, since it is such a complex experience. The premise of the game is an isolated culture, Mo, where people have chosen to stick to their oldways and remove themselves from the march of progress. They look and act similar to rural scandinavia circa mid-1800s, but their beliefs and traditions are what makes this more than just a lovely old-timey game. In women, they believe, lies the force of life. This is the force that allows them to be fertile and bear children, but it is also a dangerous and destructive force, that must be controlled so that the world itself is safe. This is the basis for the rituals we played through during the run of the game. Rituals where girls became women and woke up the life within them, boys were tested to become me and the two were joined in marriage. Each ritual in the sequence itself completely simple, but put together they became a sort of machine that produced horrible, horrible people. 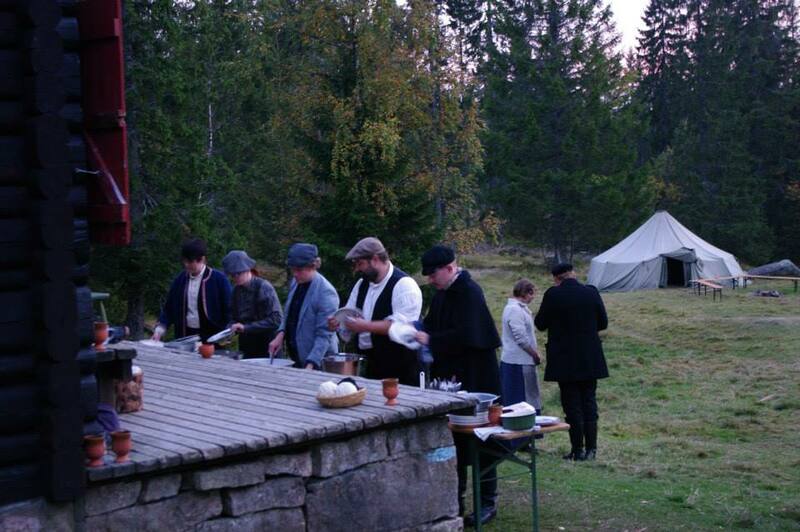 And it was a terrible experience on many levels, this was really the quintessential nordic larp self-traumatizing emotional masochism that we all love and celebrate. But not a gratuitious one, like many strong games it had a basis in reality, that crept up on you afterwards and made you realize new things about people in the world. For me, that realization came from playing a somewhat innocent young boy forced to become a terrible and tyrranical man, and celebrated for it. A boy who forever regretted that he didn’t kill his sister for the family honour, betrayed his brother and who hated the wife he was given, but felt that he had a just and happy life, that he did right. I have rarely had less sympathy for a character afterwards, but the whole way through I played him as human as I could. The singular truth of this game for me is that while the society in the game was extreme and unreal, we all carry the seeds of it within us. And there are societies in the world that are closer to it than the life we lead here in the safe and free north. There were more realizations for me and a lot of my fellow participants afterwards: How freedom and community is a thing that the oppressed can yearn for, while the oppressors must always be vigilant and lonely. How and why men choose to be the enemy of everyone, rather than open up. How blind women can be, to the realities of how they are oppressed. How children are broken and brought to perpetuate the sickness. I’ve had to a massive amount of post-processing: Writing, thinking, drinking and crying to extricate myself from the character and his world. But I probably can’t, since the he is made up of traits I have tried more or less successfully to discard over the years: My teenage insecurities, my hatred of women who rejected me, my fear of not fitting in, my anger that lurks beneath, at all times. The massive and yet unbroken walls I can place my emotions behind when it is necessary. And that was just a fraction of the game experience. At the same time as I had my experiences there were girls losing their freedom in one last violent expression of sexuality; women compeltely subservient to men, hoping for a beating; keips balancing between the genders, free and impotent; and men with no freedom at all, except to fulfill their roles as lone judges and punishers of any missteps. None of which I was part of and barely even aware of. The debrief was a bit short and segregated compared to the experiences we’d just been through, I had to supplement with some personal tricks and extra time to talk during the cleanup and after coming home. There still a lot of stuff floating around unprocessed, but I think that cleaning up from this experience is a long term project. It also means that I’ll have to reconsider a lot of things about gender, equality, masculinity, our current culture and myself in it. I have made some very powerful discoveries that need to be thought through as well, some that feel important and under-explored by a lot of contemporary discourse. And I’m most certainly a lot better off than the poor, poor people of Mo.